Harvest – The grapes are picked when they are ripe, usually as determined by taste and sugar readings. Stemmer Crusher – This removes the stems from the grape bunches, and crushes the grapes (but does not press them) so that they are exposed to the yeast for fermenting, and so the skins can better impart color to the wine. Fermentation – Yeast turn the sugar in the wine primarily into Carbon Dioxide, Heat and Alcohol. Maceration – This is how long the must (juice and grape solids) is allowed to sit, picking up flavor, color and tannin. Too long and the wine is bitter, to short and it is thin. Pumping Over – Skin and other solids float to the top, and need to be pushed back down to stay in contact with the must. This “cap” can be punched down with a tool, or you can pump must form the bottom over the cap and submerge it that way. End of Maceration? – The winemaker must decide if the must has sat long enough. Remove Free Run – The best quality wine is made just from the juice portion of the must. It is removed and the rest of the drier must (now called pomace) is sent to the press. Press – This squeezes the remaining juice out of the pomace. If you do it too hard, or too many times, you get low quality wine. Settle – The juice, now wine, needs to settle after this ordeal. Rack(ing) – Moving the wine from one barrel to a new barrel allows you to leave solids and anything that might cloud the wine, behind. 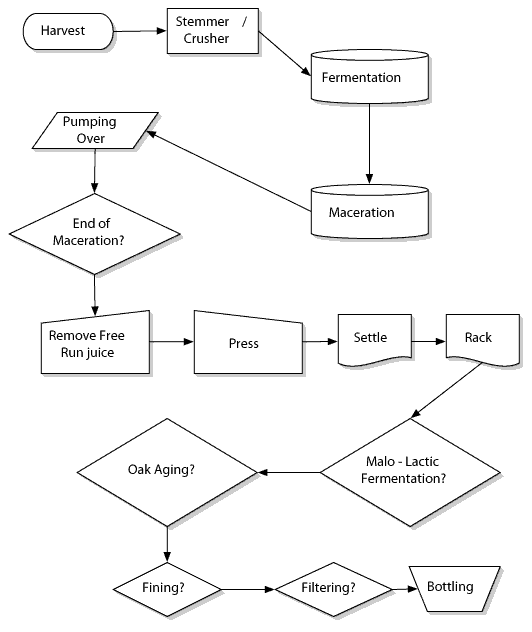 Malo-Lactic Fermentation – This secondary fermentation can turn the tart malic acid (of green apples) into the softer lactic acid (of milk). Many, but not all red wines go through this step. Oak Aging – Oak is expensive, if the wine is not meant to age for years, the winery may put the wine in oak for only a short time, or not at all. 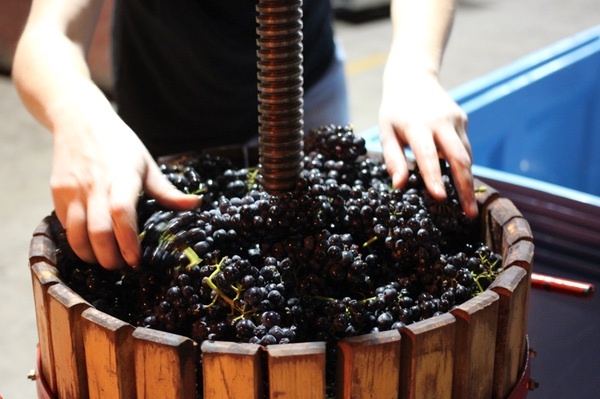 Fining – A process that helps to remove anything that may be making the wine cloudy. Filtering – A process that removes any fining agents, or other undesirable elements in the wine. Bottling – This is done carefully so that the wine does not come in contact with air. Finer wines may be stored for several years in bottles before they are released.